The purpose of this simple presentation of the legal framework in Cambodia is to give users who are not familiar with the Cambodian legal system a clear overview that will help and guide them within the legal materials made available on Chbab.net. The law is a set of rules which a particular country or community recognises as regulating the actions of its members and which it may enforce by the imposition of penalties. In Cambodia, there has been an evolution from unwritten customary law, prevalent during Angkorian times, to statutory law, which are written rules passed by relevant legislative bodies. The Cambodian legal system was heavily influenced by the French civil law system under the colonisation from 1863 to 1953 and up until 1975. Under the Khmer Rouge, from April 1975 to June 1979, the whole Cambodian legal system with its existing laws, judiciary and governmental institutions were destroyed. Many judges, lawyers and legal practitioners were killed. After the Vietnamese troops came to Cambodia in 1979, the Cambodian legal framework was affected by the Vietnamese system (contract law, in particular, is a product of the Vietnamese influence). During the presence of the United Nations Transitional Authority in Cambodia (UNTAC) from 1991 to 1993, a particular number of laws, including a criminal law, a judicial law, and a press law were enacted. As a result of foreign legal assistance to legal and judicial reform in the country, the Cambodian system also absorbed a few elements of the common law system. The current legal system is therefore a hybrid system combining all these influences. The Cambodian legal system is a statutory law system, which means it is mostly based on written law set up by a legislature. Sources of law in Cambodia are numerous and can be classified in two categories: the primary sources and the secondary sources. The secondary sources are more informal: customs, traditions, doctrine and judicial decisions. In civil cases, when there is no written law pertaining to the case or when the law is not clear enough, the judge can consider customs, traditions, conscience and equity.2 As for past judicial decisions, while in Cambodian courts other than the Extraordinary Chambers in the Courts of Cambodia, they are not often referred to, they are at the Arbitration Council, a quasi-judicial body where collective labour disputes are resolved. The hierarchy of norms is as follows, starting from the highest level of legal force to the lowest level of legal force. Repeals the contrary inferior norms. 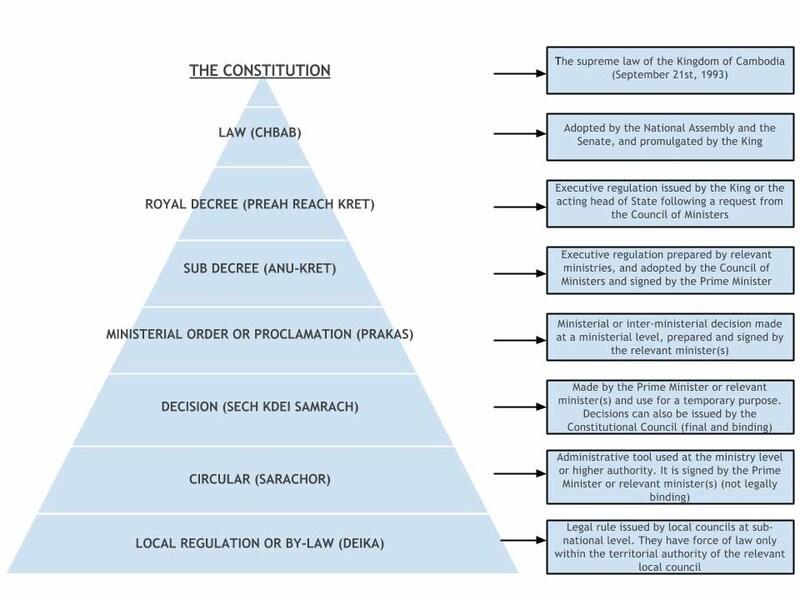 Sub-Decrees (Anu-Kret) are used to clarify provisions within existing laws, set out the functions and duties of government bodies or appoint government officials.5 It is the most common government decision.A Sub-decree must conform with the Constitution and the law to which it refers. Decisions (Sech Kdei Samrach) are usually issued by the Prime Minister or relevant minister(s), and are used for a temporary purpose (they disappear once their goal is reached).7 The term “decision” is not defined by law. In practice, there are different types of decisions: a decision made by the Constitutional Council, a decision made by the Prime Minister, a decision made by relevant minister(s), etc. When a "decision" is issued by the Constitutional Council, it is final and binding and has supremacy within the legal system, meaning that all laws and regulations must strictly conform to it. Local Regulations or By-laws (Deika) are legal rules issued by local Councils at the sub-national level, including the Capital Council, Provincial Councils, Municipal Councils, Districts Councils, Khans Councils, Sangkat Councils and Commune Councils.10 They have force of law only within the territorial authority of the local Council that has issued it, and cannot conflict with any other legal instrument at the national level. 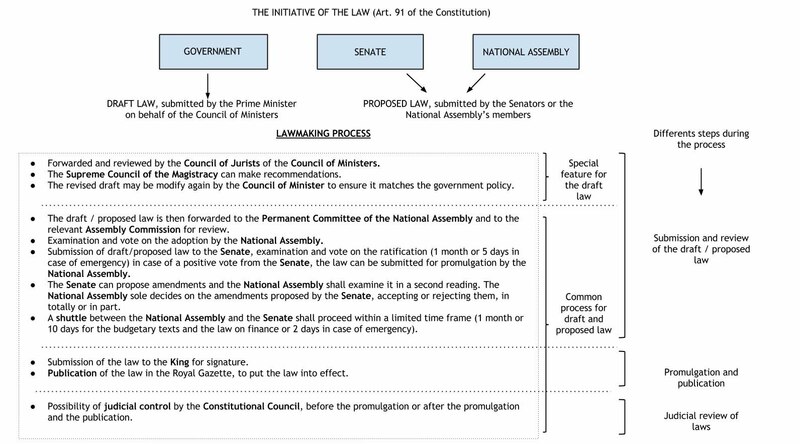 According to Article 91 of the Constitution, the Senators, the National Assembly’s members and the Prime Minister have the right to initiate legislation. Laws can be either “proposed” and “drafted”: when a bill is “proposed”, it means that it is coming from National Assembly members or Senators, whereas when it is “drafted”, it is initiated by the government. According to Article 136 of the Constitution, the Constitutional Council shall have the competence to interpret the Constitution and the laws adopted by the National Assembly and definitively reviewed by the Senate. 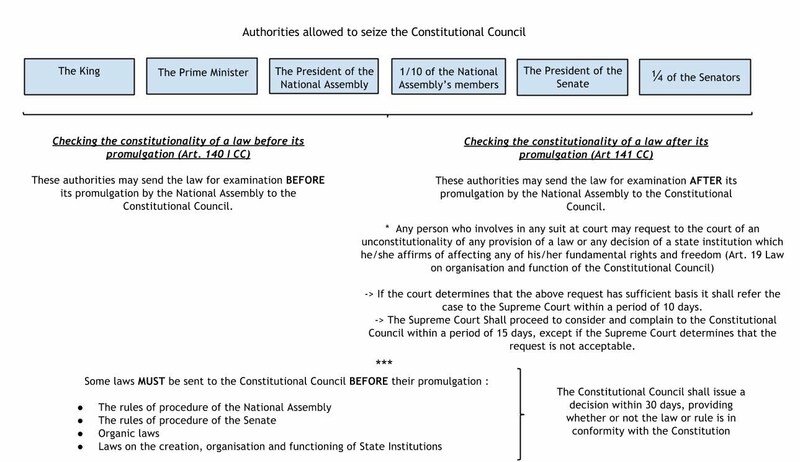 Aside from the Constitutional Council, a law can be interpreted by the court (who applies the law) and the government (who implements the law). As mentioned above, in instances where the law is not clear or when there is no stipulation about a particular case, the court should refer to Cambodian customs, traditions, equity and conscience (secondary sources of law). According to Article 26 of the Constitution, the King shall sign and ratify international treaties, both multilateral and bilateral, and conventions, following the approval of the National Assembly and the Senate.11 After such ratification, international treaties and conventions shall become laws and may be used as the basis for judicial decisions. 1 The Constitutional Council, CASE Nº131/003/2007 of June 26, (2007), Decision Nº 092/003/2007 CC.D of July 10, (2007). 2 Law on the Organisation and Activities of the Adjudicative Courts of the State of Cambodia, Art 4 (1993). 3 Constitution, Art 150–new (1993). 4 Constitution, Art 28–new (1993 as amended in 1994 and 1999). 6 Law on the Organisation and Functioning of the Council of Ministers, Art 28 and Art 29 (1994). 7 Law on the Organisation and Functioning of the Council of Ministers, Art 13 (1994), See also Sub-decrees the Organization and Functioning of the Council of Ministers, Art 13 (1994), See also Sub-decrees on Organisations and Functioning of Ministries. 8 Law on the Organisation and Functioning of the Council of Ministers, Art 13 (1994). 11 Constitution, Art 26 (1993). 12 The Constitutional Council, CASE Nº131/003/2007 of June 26, (2007), Decision Nº 092/003/2007 CC.D of July 10, (2007). 13 Constitution, Art 31 (1993).